I love coloring. I always have. I recently decided that I wanted to color, gosh darnit, and so I would get some coloring books and colored pencils. While I was in Juneau for Kyle’s wedding, I visited two quilt shops. I wanted to visit at least one, so Ash pulled up the GPS app on his iPhone and we went to the first one on the list. That was RainTree Quilting. RainTree Quilting is located off of Mendenhall Loop Road. A few trees separate it from the street, but the store itself has enough front windows to give the place a light, airy feel. They have a show room and a class room, with completed quilts hanging in each. The fabric selection reminds me of what Quilt Tree carries here in Anchorage, in terms of color values and the types of patterns they carry, though there were fewer oriental fabrics. The owner was in that day, with one employee. Both were friendly and helpful; we got to chatting a bit about Anchorage quilt stores and quilt tourism in general. I may be only starting quilt store touring, but they said that people come through from all over. They were fine with me taking pictures (though many of them came out poorly). I ended up cutting both the picture taking and the chatting short, though, because Ash and Patti were demonstrating signs of boredom, eventually retreating to the car. I’ve decided that I will get a fat quarter of some green fabric and a yard of something else nifty from each quilt store I visit in my travels. From RainTree Quilting, I took away a bright green fat quarter with a scratchy/speckly pattern and a dark blue batique with a dog sledding pattern on it. It’s possible I could have gotten that same batique from The Quilted Raven in Anchorage, but I wasn’t sure and it really appealed to me while I was there. I found my visit to RainTree Quilting a pleasant experience, and recommend the place highly. More pictures can be found on Flickr. I have completed my first patchwork quilt top! It’s actually been completed for a couple of weeks, but I didn’t get around to taking pictures of it quickly. I cut three 2.5″ squares from each of 40 different fabrics, which I put in a bag. After shaking the bag until they were thoroughly mixed, I pulled them out, stacked them, and made rows of ten squares each by pulling them off the stack. I didn’t count how many fabrics I used; I’m lucky it came out in a number divisible by ten — I had no squares left over. Once it was all sewn together, I took my mish-mash to The Quilt Tree and picked out the border fabric. (Thank you, Shannon, for advice about the color). I didn’t realize before going there that Quilt Tree is a combined quilting and yarn crafts shop. And they don’t waste any space. They have bolts of cloth on top of shelves and leaning against shelves on the floor, leaving just enough space to peruse. I didn’t wander into the yarn section — though I probably should have, since I need some supplies for my Halloween costume — but it looked just as crammed as the cloth half of the store. I found this book at the Loussac Library, and I am so glad I grabbed it. I highly recommend it to anyone interested in quilting. In the process of working my way up in difficulty to the needlepoint projects I daydream about, I am making a tissue box cover. I’m pretty sure everyone who’s ever done plastic canvas needlepoint has done at least one of these, and by the time I finish this project I will be no exception. Mine is a simple display of characters from the original Final Fantasy for the NES. The order in which they appear on the box is semi-inspired by 8-bit Theater. I’ve got the fighter and black mage on one long side of the cover, with the white mage and monk on the other long side. 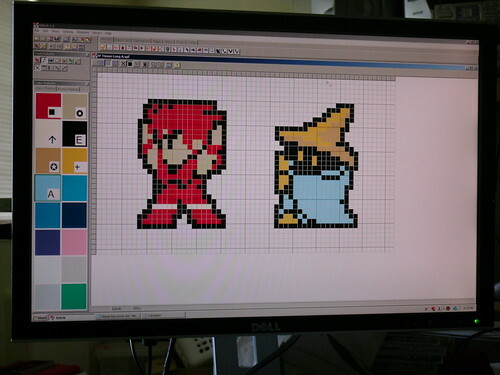 The thief and the red mage each have a panel of their own. The final product will have physical and magical damage dealers alternating all the way around the box. Check out this Final Fantasy plastic canvas album on Flickr for more and larger images. The pattern I made on my computer for one of the long sides. In my previous post on plastic canvas needlepoint, I talked a bit about what it is and what people have done with it. In this post, I chronicle the embarkation of my journey toward understanding what all can be done with it, and how. You can find larger versions of all pictures shown here on Flickr. For the most part, the coolest things I’ve seen don’t seem truly inspired. I don’t mean to dis them here… they’re really quite nifty. And a small percentage are downright fantastic. But here we sit on all the possibilities of three-dimensional stitch work, and people make plain boxes. Some of the boxes are very nice. Some incorporate a little bit of extra three-dimensional-ness in the form of sewing one or more flat, decorational panels to the outside. The bulk of them are just plain ol’ squares.